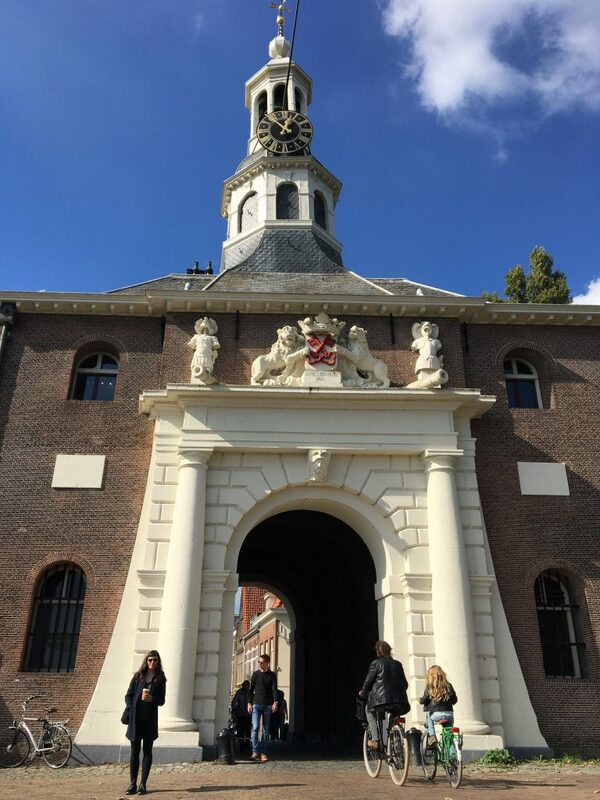 The plan was to spend the morning in Leiden, then cycle to De Hague, Delft and Rotterdam, but after our ride from Amsterdam to Leiden, we decided not to repeat the mistake of cramming too many places and sights into one travel day. 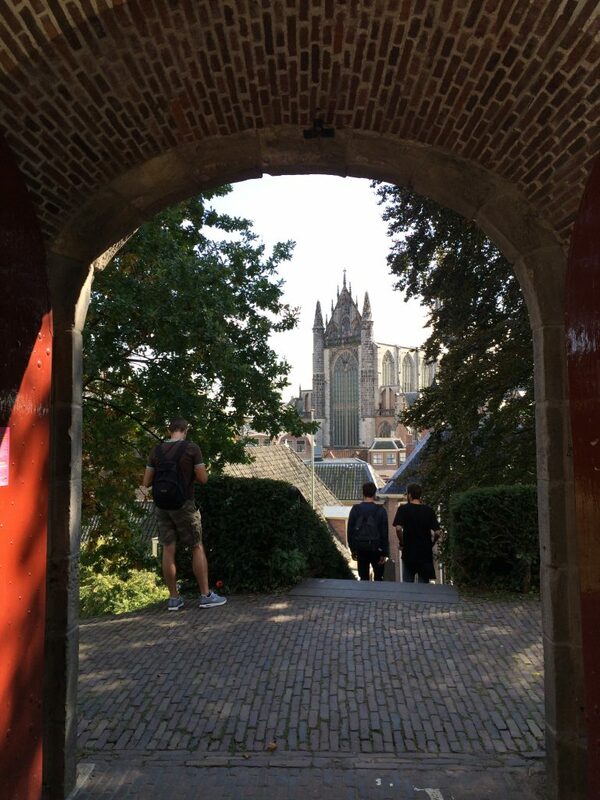 Instead, we opted to wander around Leiden, not rushing ourselves, and if we ran out of time to cycle to Rotterdam, we’d just take the train. 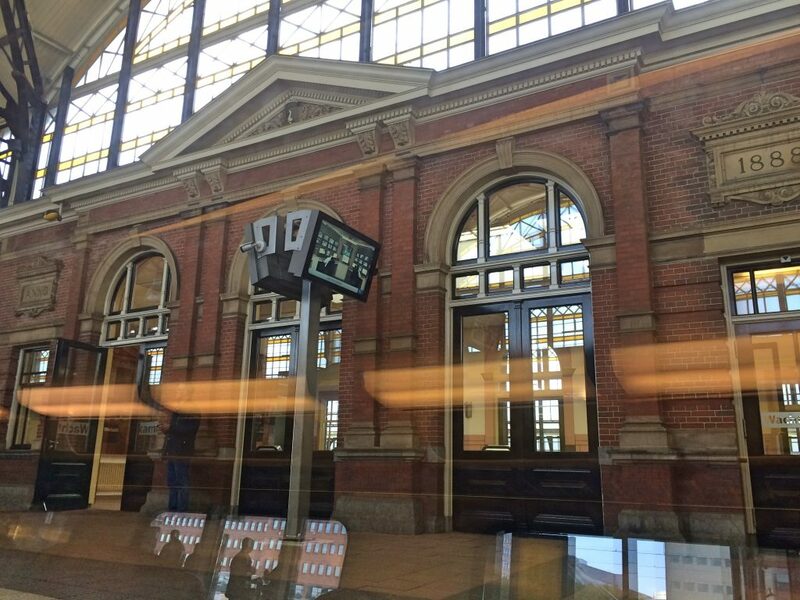 After all, our hotel (The Ibis Leiden) was conveniently located right beside Leiden Central Station. 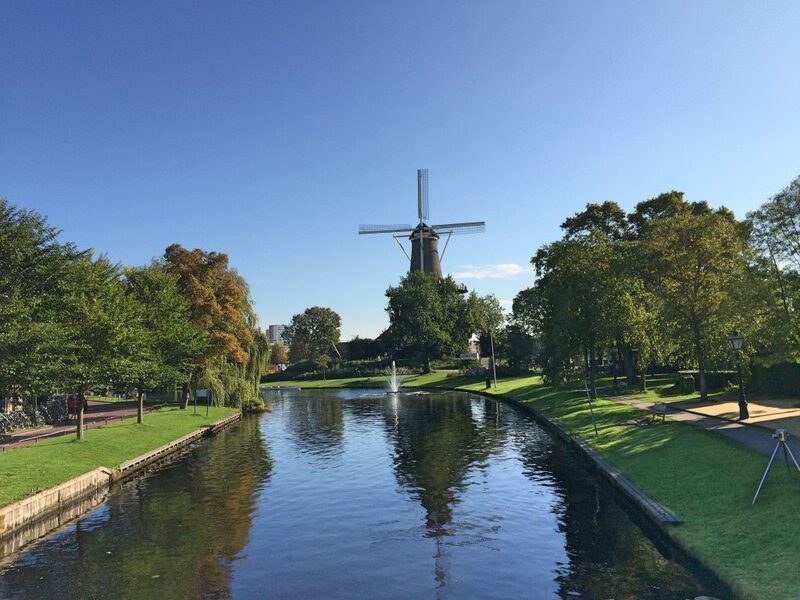 Leiden isn’t very big, so we left our Bromptons at the hotel and went out on foot. 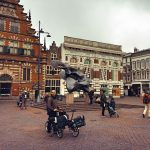 Bicycles are great to get the lay of the land in a city, and are especially handy if attractions are spaced far apart, but in a tiny place like Leiden, walking is the best way to take in the sites. 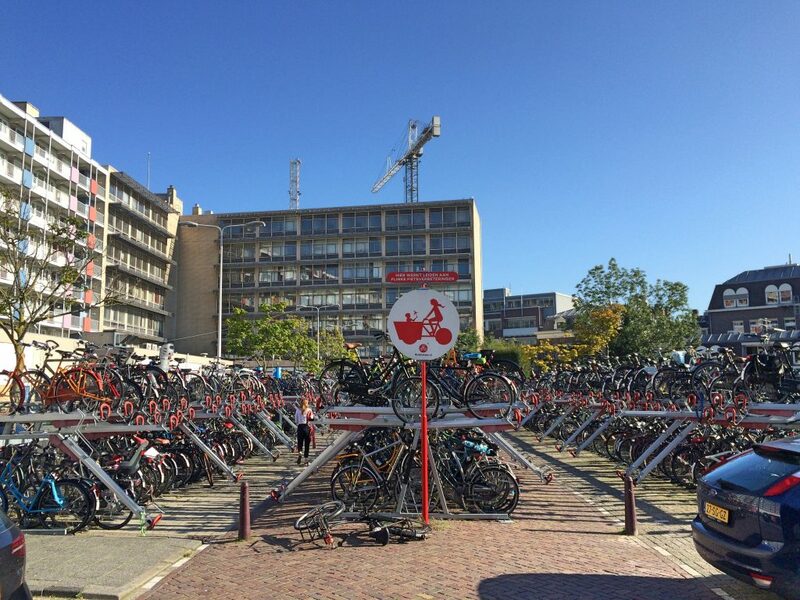 So we headed out, and right behind our hotel we found this amazing double-decker bicycle parking lot! 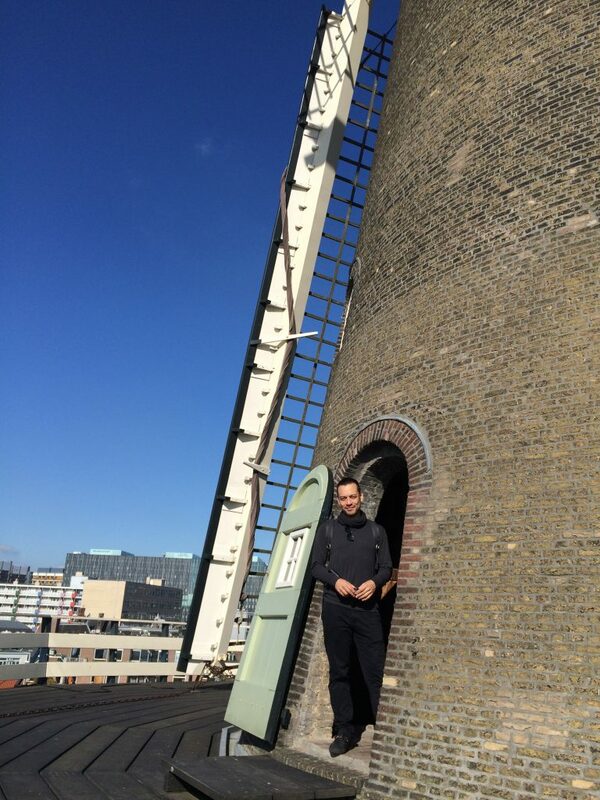 After I got over the awesome bike parking amenities in Leiden, we made our way to the town’s top tourist attraction: De Valk, the Windmill Museum. 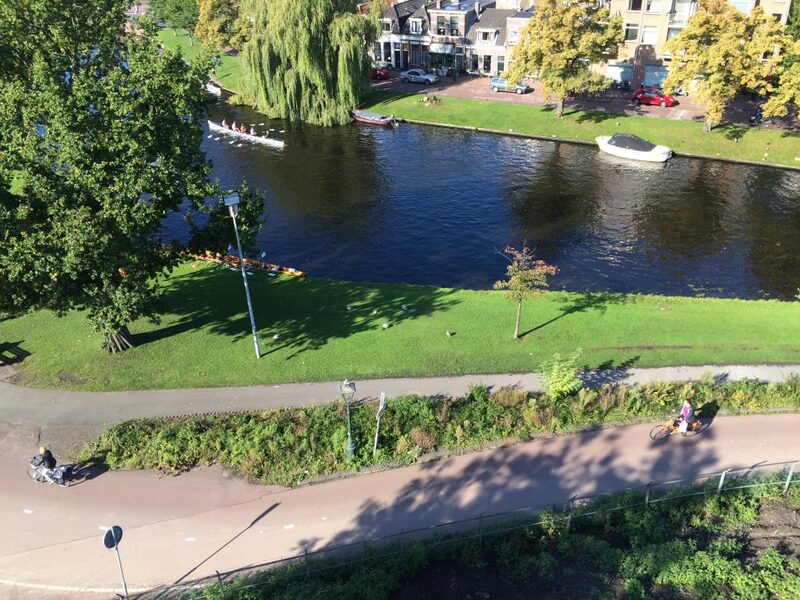 Looking down from the windmill gives a view of a canal surrounded by nature and bike paths. Notice that there aren’t any posts to lock the bicycles to. 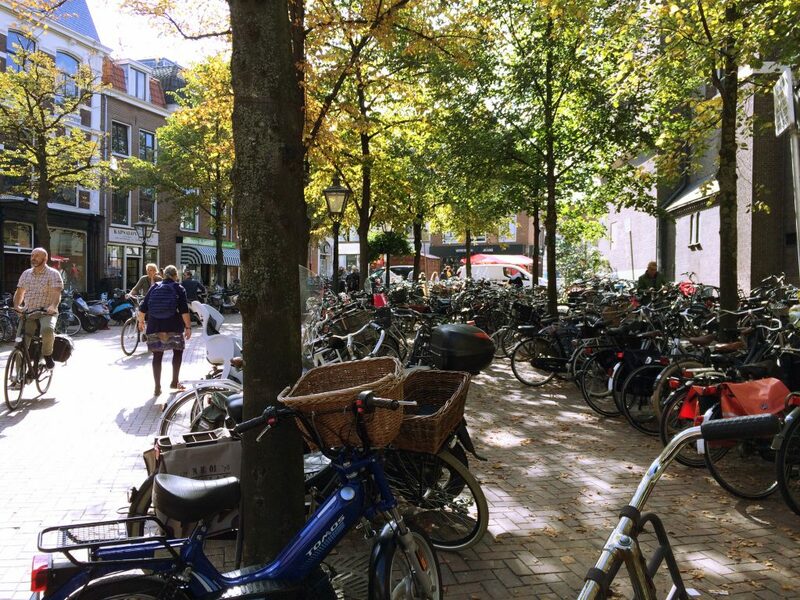 But this isn’t a problem in The Netherlands where most bicycles have a rear wheel lock permanently installed on their bike that, when locked, completely prevents the wheel from rolling. 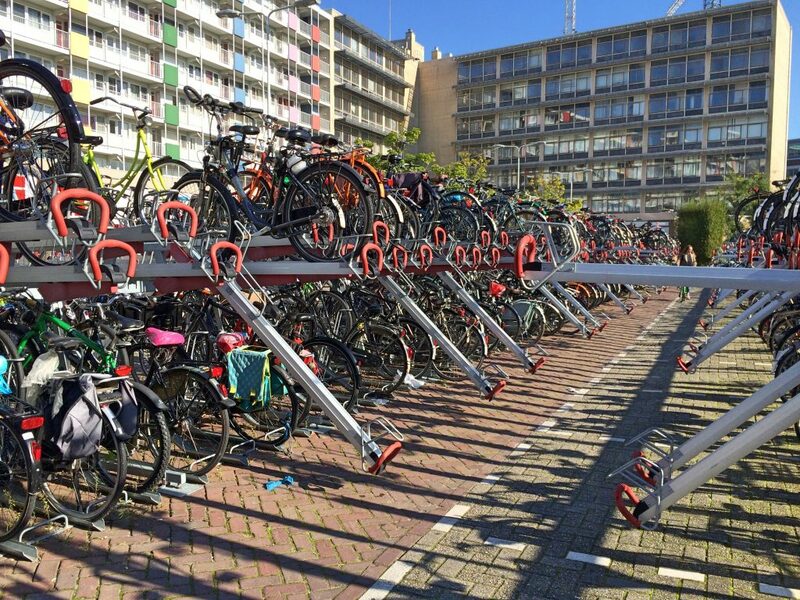 This isn’t common in any other country, so it’s just called a “Dutch bike lock.” For more information, see The Cycling Dutchman’s post The Convenience of the Dutch Bike Lock. 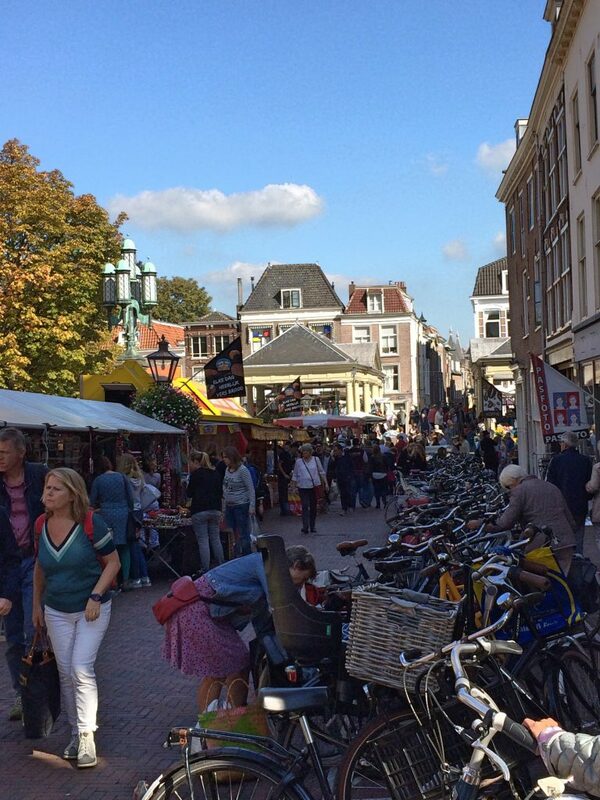 We continued on, down narrow cobblestoned streets with no room for car parking but plenty of space for bicycles. 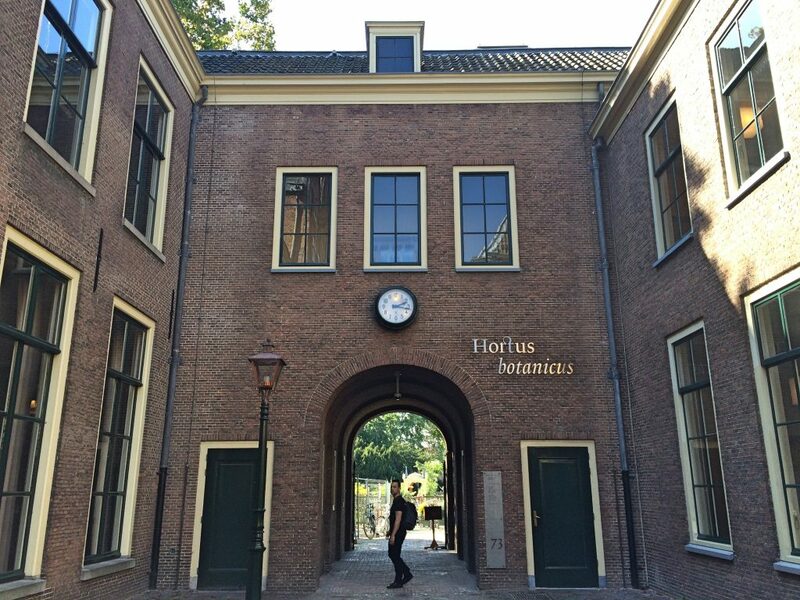 Soon we found ourselves at the Zijlpoort, one of only two surviving gates into the old city. 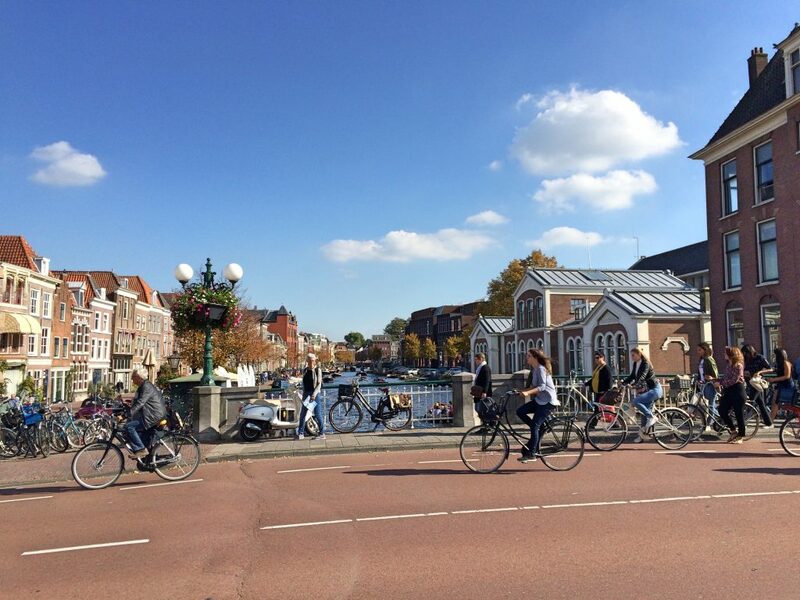 Of course, only pedestrians and cyclists can pass through it into this car-free area of Leiden. 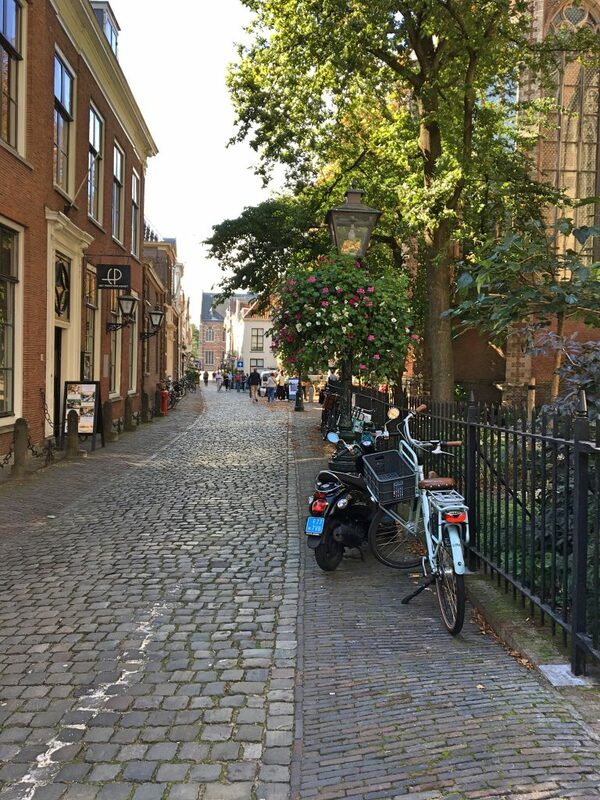 This beautiful street in the photo below leads to the Hooglandse Kerk, an insanely large 15th-century church. 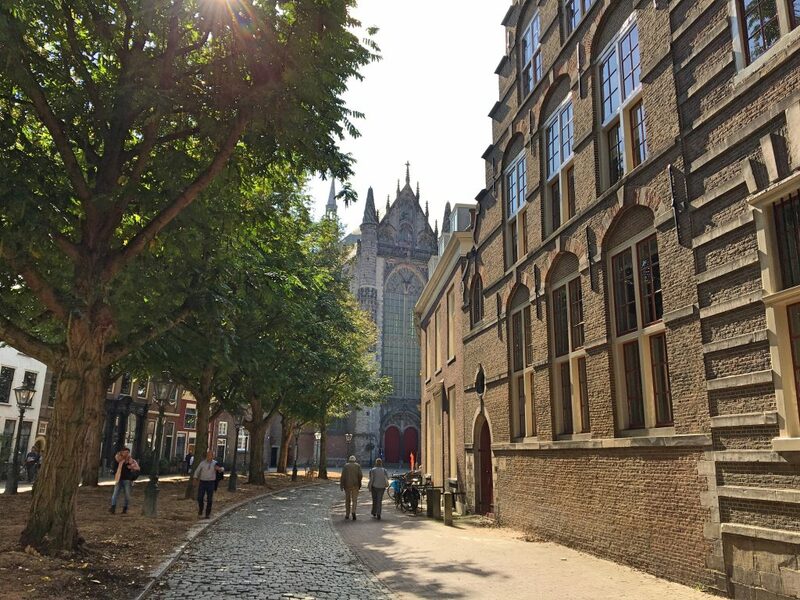 But the street also reminded us of why walking is sometimes nicer than cycling in these old towns — the cobblestones look as ancient and bumpy as the church! 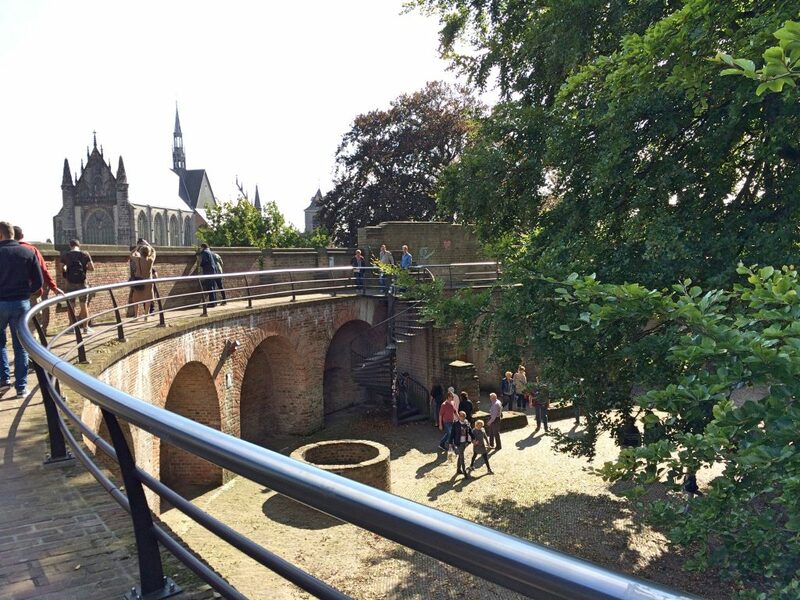 Then we wandered up De Burcht, an 11th-century citadel built for defence on an artificial hill. That’s right, The Netherlands is so flat that they had to build fake hills for their lookout towers! 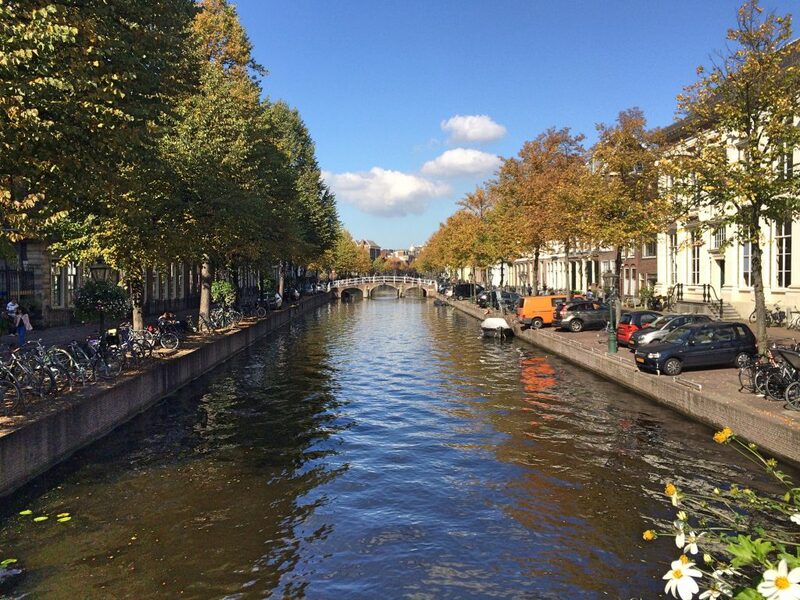 After we found ourselves in the Saturday Market on a bridge. Again, bikes with Dutch locks were parked anywhere there was space. 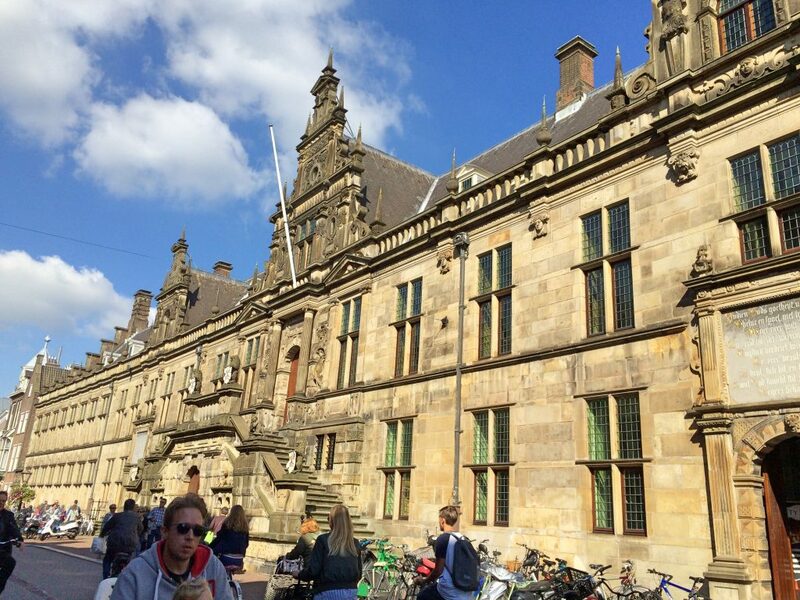 Then we came across Leiden’s massive town hall! Until we arrived at the botanical gardens. 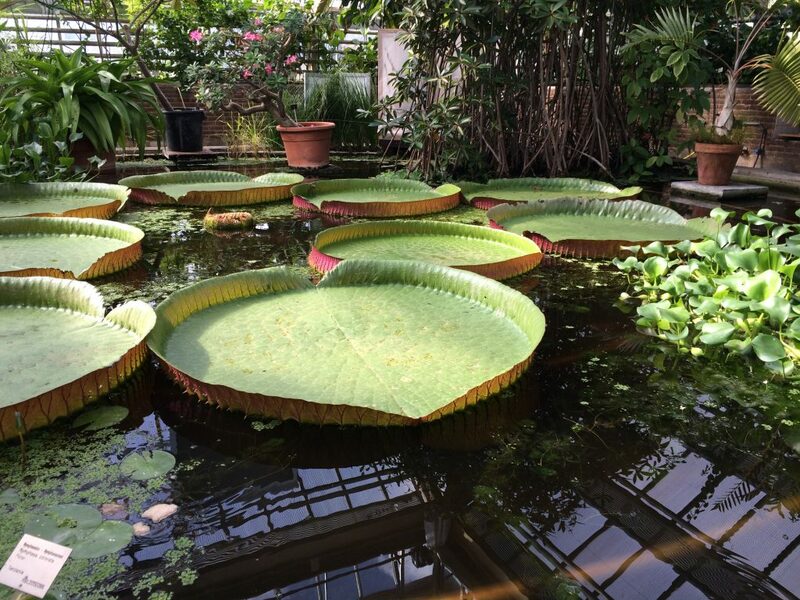 In which the biggest attraction is these GIGANTIC water lilies! By this time it was late afternoon and we were out of time to cycle to Rotterdam, so we took the train. 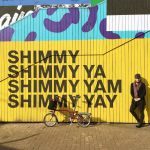 Travel Tip: Don’t put Bromptons in B-Bags for train travel. But we’d already packed our Bromptons in their B-Bags to store in the hotel’s bag room, so we took them like that to the train. This was a mistake. The B-Bags only have two dinky wheels that do not roll well and, worse, give the bag a tendency to tip over. Plus, if you’re not super tall, you have to pull up on the handle to keep the non-wheeled end of the bag from rubbing on the ground. So the half kilometre walk to the station was slow going and burned our biceps. It would have been quicker to unpack the Bromptons, ride them to the station, and refold them there. Another thing… Taking the Bromptons on a commuter train inside their B-Bags is awkward. The bike+bag combo is big and heavy, and on a commuter train there’s nowhere to put suitcase-sized luggage, so we had to find seats for our bags. However, a folded Brompton and a rolled-up B-Bag carried under an arm take up much less space. 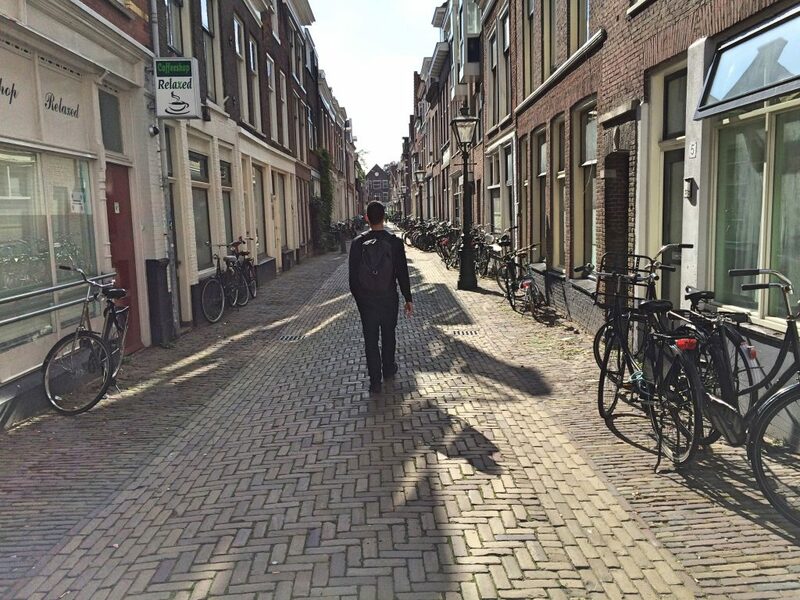 So from here on in, that’s how we travelled — cycling to the station wearing our backpacks, the B-Bags already rolled and strapped to the back rack. Then at the station, fold the Bromptons, put the rolled B-Bag under our arms, and push the Bromptons on their Eazy Wheels to the train. Because those wheels are sooooo much better than the wheels on the B-Bag! In conclusion, use the B-Bags for air travel but never train travel. 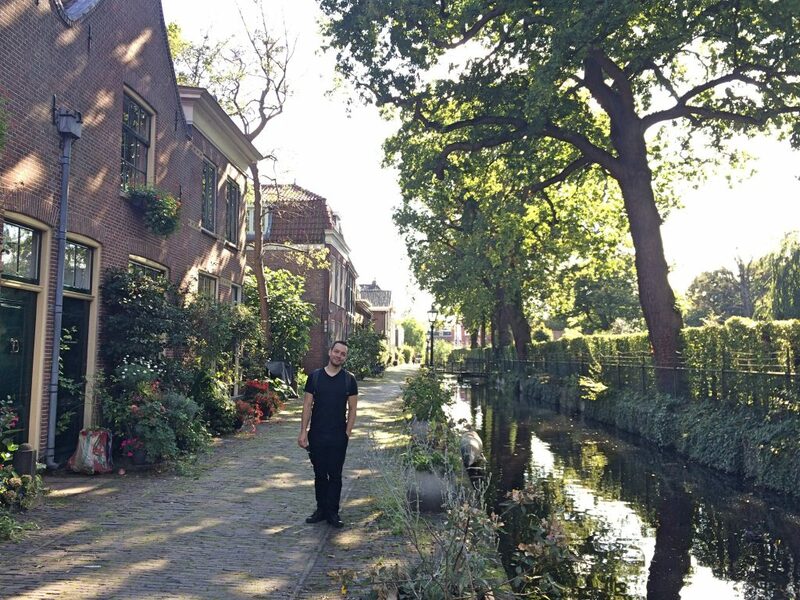 Next up… We arrive in Rotterdam and fall in love!